In the second episode, we get inside the mind of CEO of Keen Software House - Marek Rosa and Community Manager Ansel Leos. These guys join us to talk about their brewing space sim – Miner Wars 2081. We talk about some of the challenges indie game developers face as they push their game into market. 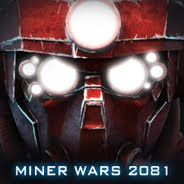 Miner Wars 2081 is a game I’m hoping to see the light day considering all of the graphics and concepts being fleshed out. But at what point do you start dealing with scope creep? I push Rosa and Leos to the limit as my expectation for the Miner Wars game is to simply see it finished. We talk candidly about how they deal with developers, feedback and overall scope of the game. Rosa also talks about how he crafts the story on Miner Wars and I spill my impressions on it. Seeing the game through. Giving it that ummmph. wow great one post and the content of the blog is really awesome. i really like the way that how you execute the content so please make some tool for epos and the benefits of epos.